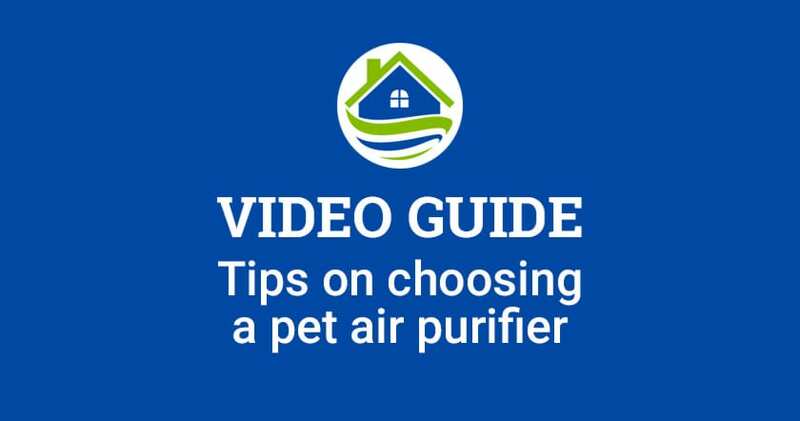 To find out more about each of the air purifiers mentioned in the video and how each they can help get rid of pet dander, hair and odors inside your home, take a look at our free guide on the best air purifier for pets. Are you looking for an air purifier for pets, but not sure which one to get? Do you want to get rid of pet dander, odors or hair in your home so it’s cleaner and fresher? In the next few minutes, you’ll learn what the top features are to look for in a pet air purifier as well as the three best products you can buy today. When you’re shopping for an air purifier to help with pets, the first thing you want to look for is one that uses a “True HEPA” filter. Why? Because it’s the only type of filter that’s certified to remove 99.97% of allergens as small as 0.3 microns. This includes all types of pet dander, from every kind of animal, as well as pet hair. The second thing you want to look for is an Activated Carbon filter. This filter is specially designed to absorb odors that your pets leave behind. An air purifier with this filter will keep your home smelling fresh and clean and less like a dog kennel or cat litter box. A third optional feature you may want to consider is a UV-C light. This unique technology destroys airborne bacteria and viruses and helps keep you and your pets healthier all year round. Now that you know what features to look for in an air purifier, here are the top three products you can buy today. Number one is the Winix HR900 Ultimate Pet Air Cleaner. This product includes a True HEPA Filter and Activated Carbon Filter to get rid of pet dander, hair and odors. It also has patented PlasmaWave Technology which works to fully sterilize your air from household germs. It’s best for medium to large size rooms up to 300 square feet and is one of the best air purifiers available for pet owners. Number two is the Hamilton Beach True Air Compact air purifier. This small device includes a lower grade HEPA filter that’s made for removing pet hair and larger pet dander particles. It also includes an Activated Carbon filter for reducing pet odors. If you want portability or an air purifier for small rooms up to 160 square feet, this is a great inexpensive choice. The third best air purifier for pets is the Germ Guardian AC4825. It includes a True HEPA filter, Activated Carbon filter and a UV-C light to neutralize all types of indoor contaminants. The tower design is a nice touch and it can fit practically anywhere inside a room. It’s good for small spaces up to 167 square feet. If you want to find out more about any of these air purifiers, click on the link in the description below to view our FREE in-depth buyer’s guide. Also, leave a comment if you have any questions and hit the thumbs up button if you found this video useful. Thanks for watching!